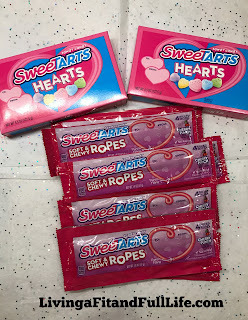 This season of love, show that special someone how you feel with special edition SweeTARTS Hearts (4.5 oz./MSRP: $1.50) and sweet and tangy SweeTARTS Soft & Chewy Ropes (1.8 oz./MSRP: $.89)! The perfect sweet addition for your Valentine’s Day cards, these treats with no artificial flavors or colors are great for love-themed recipes, gifts and décor to help unleash your inner Cupid. 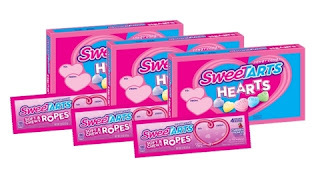 Feel the love with new Valentine's Day products from Nestlé SweeTARTS! As a mom of 4 I know my kids love candy and I have to admit I do as well. I have a tradition on Valentine's Day of surprising my kids with a little bit of candy and a small gift. It's a tradition that they seem to remember even since they were very little which tells me that they will remember it when they are grown and out of the house. I'm all about making memories but I'm also about being healthy which is why I love that these sweet treats from Nestlé SweeTARTS contain no artificial flavors or colors. They also taste incredibly amazing and are sure to satisfy any sweet tooth cravings! Nestlé SweeTARTS are the perfect treat this Valentine's Day!